Part of exploring Canada is experiencing its history. 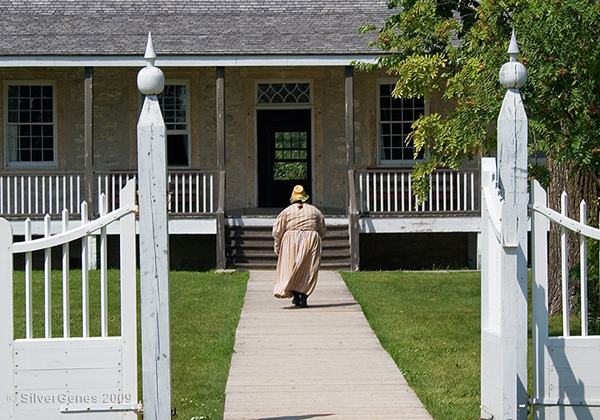 Manitoba has a rich past filled with legendary characters who helped forge this nation. People like Metis leader Louis Riel who was hanged for treason and is now recognized as the father of Manitoba, Thomas Douglas (Lord Selkirk) who established the first agricultural colony, Chief Peguis who saved the first settlers from starvation, Warden of the Plains Cuthbert Grant, and Nellie McClung who got Manitoba women the vote in 1916 - the first in Canada. As a comparison for just what an achievement this was, Quebec did not follow suit until 1940! How did it all start and why here? 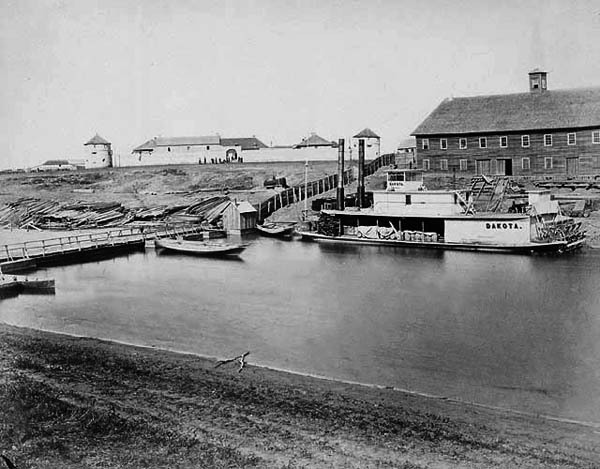 In 1806, Fort Gibraltar was built by the North West Company where the Assiniboine and the Red Rivers meet. What was the North West Company? It was a group of Montreal traders who were trying to stop the Hudson’s Bay Company from expanding into the west. Where these rivers meet is called The Forks and it has been a meeting place for aboriginal people for 6,000 years. It seemed like a natural place to build a fort that would serve as a trading and forwarding post. 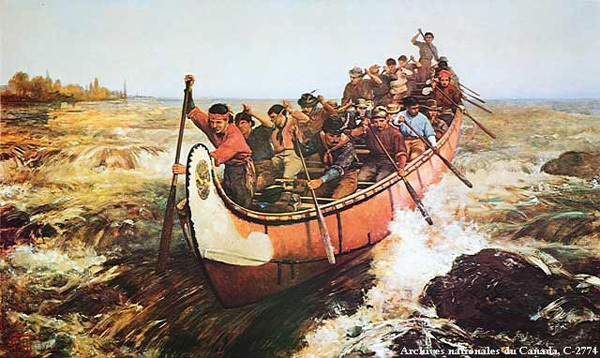 Fur traders travelled from Montreal through the waterways across Upper Canada to the western shores of Lake Superior in boats very much like this one. It is an Algonquin canoe called a ramaska. Frances Hopkins was the wife of a Hudson's Bay employee and she accompanied him on trips like this one, returning to Montreal with furs collected from other traders and trappers further north. With her paints, she captured forever the images that were a way of life for so many. 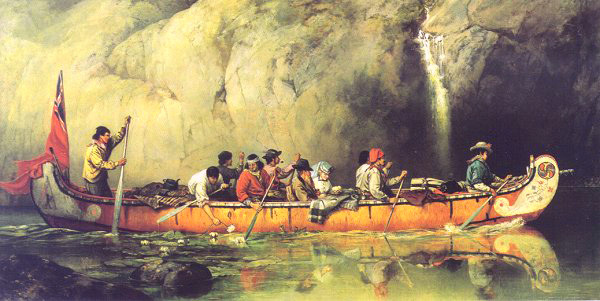 Travelling further west required a lighter vessel and they used what was known as a northern canoe to move goods. 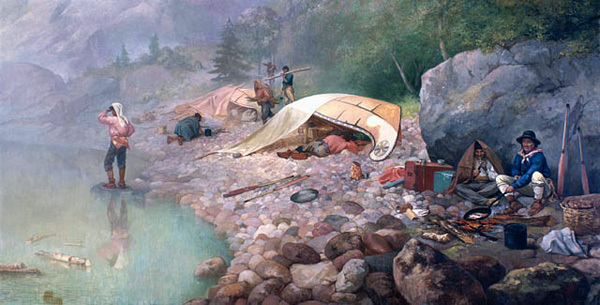 The painting below shows a typical Hudson's Bay company northern freight canoe. Although these paintings depict later journeys, they are first hand accounts that show the reality and how little had changed since the late 1600s. Things went well for about 10 years and then in 1816, the fort was destroyed and rebuilt. The second Fort Gibraltar became Fort Garry after the North West Company joined forces with the Hudson’s Bay Company in 1822. Another 10 years passed and then the new fort was devastated by a major flood in 1826. 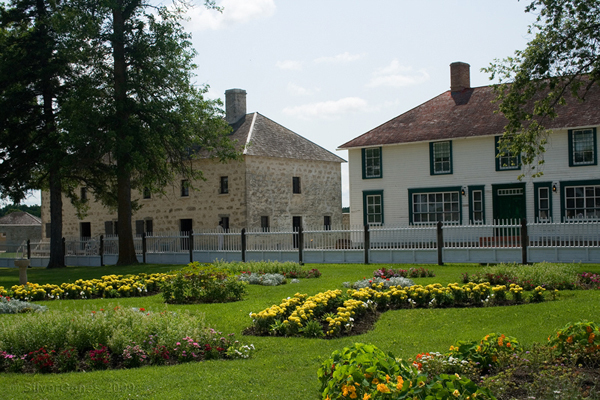 A new site on higher ground was chosen about 20 miles north and Lower Fort Garry was built in 1830. The site was ideal from a transportation point of view because portaging was no longer necessary. However, most of the people were settled near the original fort and travel was difficult. Summers were hot and thick with mosquitoes and winter winds sent temperatures plummeting to -40˚F and below. You would think that having built three forts already, that would be enough. 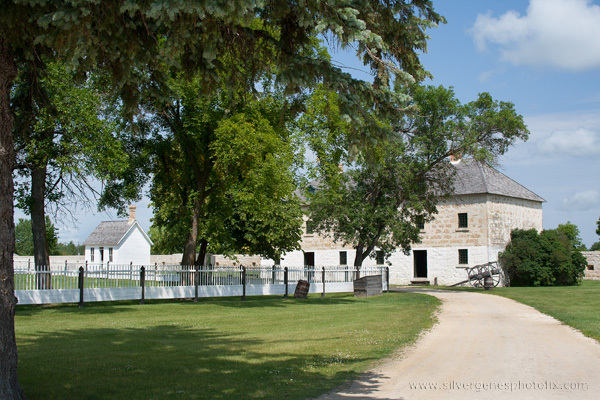 However, it became apparent that people were not going to make the 20 mile trek to the new fort so the original fort, now called Upper Fort Garry, was rebuilt in 1835. In 1882, it was sold and it’s walls demolished. All that remained is the gateway and it still stands today in downtown Winnipeg. 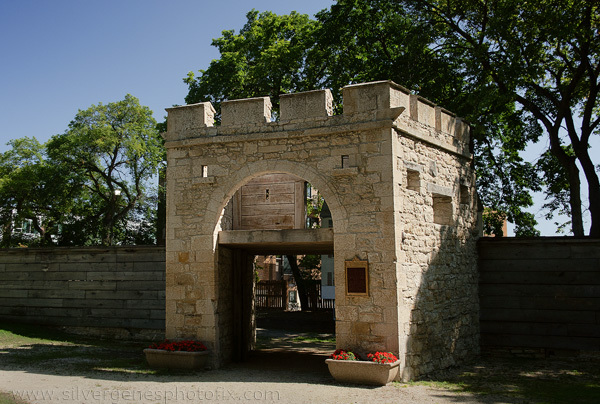 This leaves us with Lower Fort Garry and what to do with a fort that nobody wants to use for business. At first, it was ideal because it avoided the portage problem. 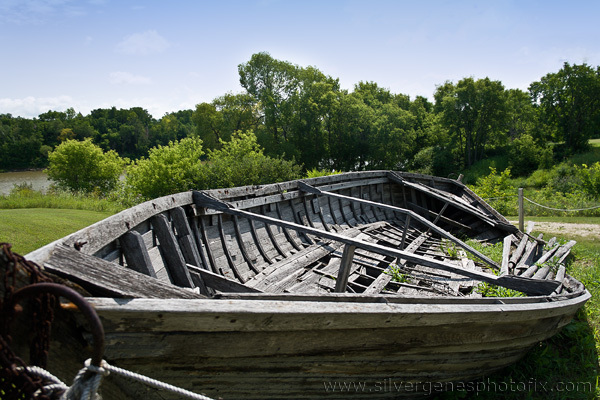 It was located along the river before the St. Andrews Rapids so boats did not have the tedious task of unloading, transporting goods and vessels overland, then reloading cargo and relaunching boats. Unfortunately, this had been a necessary step to ship goods to Upper Fort Garry. You can imagine how unpopular this was when you consider these boats, called York boats, had already made a 700 mile journey from Hudson's Bay with dozens of portages. 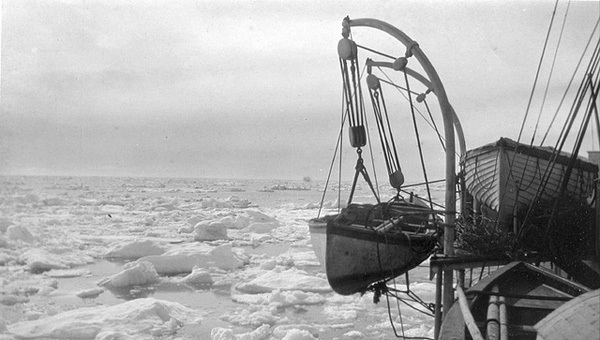 Each boat carried about three tons of supplies, all of which had to be carried by the tripmen in 200 pound packs overland. 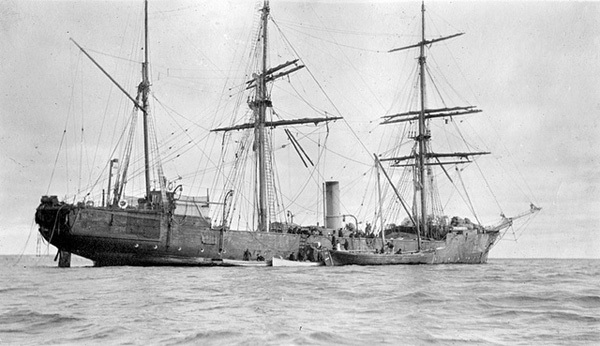 These were heavy vessels, too, and capable of handling sail. Fort Garry was never actually a main fur trading post. While some pelts were traded here, most came in from neighbouring areas and they were repacked here for shipment to England via Norway House and York Factory. Tripmen took the boats along the same gruelling 700 mile trek back up to the northern posts for loading on to ships bound for England. Sailing to England was no picnic either. Steamships made their way north through Hudson's Bay, out through Hudson's Strait into the Labrador Sea and then across the North Atlantic. The photos below are a little more recent but illustrate the conditions very well. 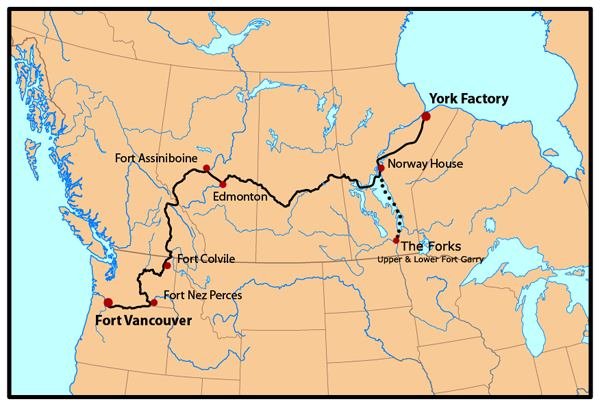 York Factory route from the Forks adapted from a map courtesy Pfly on Wikipedia. Feeding these men as well as the workers in the north was a problem. 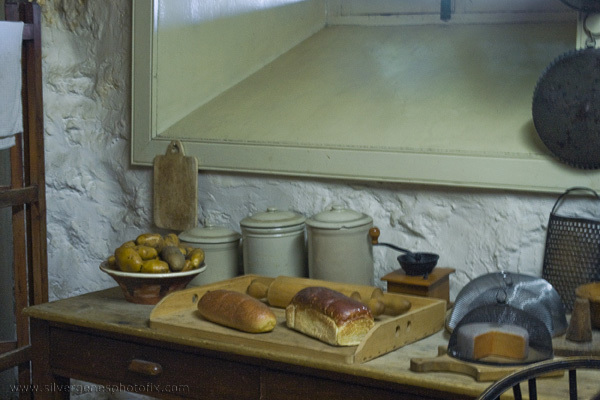 It was expensive shipping food from England and it certainly wasn't very fresh by the time it reached Fort Garry. Lower Fort Garry was the answer. 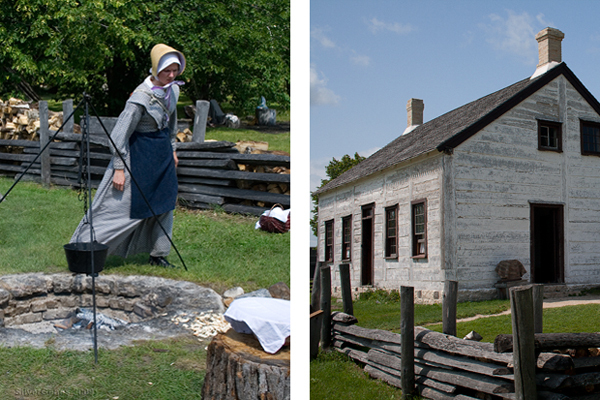 People who lived at the Red River settlement had farms and they sold the extra produce to the Hudson's Bay Company. This was shipped to the Hudson's Bay factory communities. Many aboriginal people traded leather goods, crops, and fish and others worked for the company by taking part in the annual buffalo hunts. This continued well into the 1860s with more and more aboriginal people working on company farms. The Hudson's Bay Company general store had everything from food supplies to dry goods including the famous Hudson's Bay blankets. Farming life was not easy and the housing was basic even for the farm manager. By the 1840s, construction had begun on several industrial buildings including a grist and sawmill, blacksmith shop, lime kiln, and brewery and distillery. There is a mix of many different architectural styles and materials from limestone to wood frame. 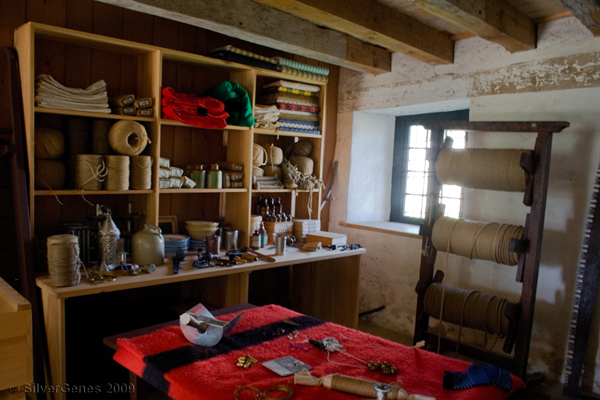 The Governor's house is located in the centre of the fort, surrounded by thick walls built more for impressing the visiting officers of the Hudson's Bay Company than for military purposes. 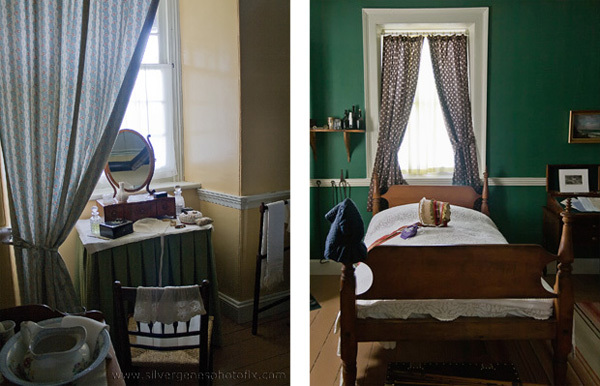 A bedroom in the Governor's house just as it was in the 19th century. Left: Pie in a pot from an outdoor over. Right: Storage shed in the Governor's house. Over the years, the fort served as a base for the Hudson's Bay Company and periodically the military, a training facility for the North-West Mounted Police (1873-74), a penitentiary, and a mental hospital (1885-86). The most infamous mental patient was Honoré Jaxon, Louis Reil's secretary who was found not guilty of treason by reason of insanity. 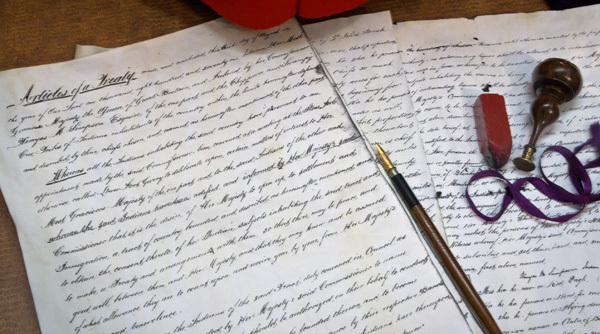 In 1871, Treaty #1 (shown below) between the seven chiefs of the Ojibwa and Swampy Cree and the Crown was signed at Lower Fort Garry. It transferred the land that is now part of modern Manitoba. 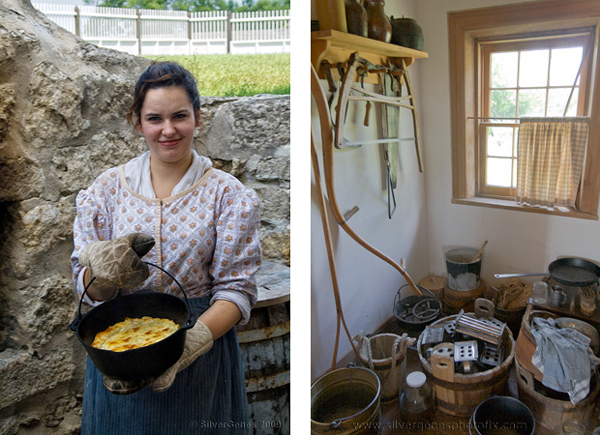 Today, there are harvest celebrations, ghost tours, and Christmas celebrations at Lower Fort Garry. Located just south of Selkirk at St. Andrews, it's an easy drive from Winnipeg and worth the visit. It gives us a new respect for our forefathers and the challenges they faced building this country. For a calendar of events, go to Parks Canada. What a hardy people they were, to travel in the long boat 700 miles with all that weight and to be able to successfully make it through the rapids and other tricky areas along their journey. Also Fort Garry is an amazing place and still functional. People dresses in the period and performing their duties for the many tourist that must pass through Winnipeg, Manitoba. Thank you for the wonderful pictures as well, you took spectacular shots and the light was on your side. I enjoyed my journey and can close my eyes and see our ancestors busily working hard to survive the harsh Canadian winters and other difficulties.